The development of new business models on the Internet, especially those related to the so-called sharing economy - such as Uber - has been accompanied by a rising number of legal and regulatory issues that threaten to jeopardise the business models’ existence. The study 'Mapping Uber' looks at the main policy issues, and the legal action undertaken against the company in various countries. Ride-sharing application Uber has seen a rapid expansion in the past three years. This has been accompanied by a wave of legal controversies, including court cases, rulings by regulatory authorities, and decisions by other administrative bodies. Most issues associated with the sharing economy are related to the fact that the sharing economy’s business model is still not clearly regulated. In expanding its business, Uber presented serious competition to traditional taxi services. Many of the initial cases against the company were initiated by taxi associations on unfair competition grounds. The key question, in 2017, was related to how Uber is classified within the scope of the regulatory regime. The answer came in December 2017, when the Court of Justice of the European Union (CJEU) ruled that Uber was a transport company, and not an information services provider. The main question in 2018 is: how will this ruling affect Uber's operations in the EU, its business model and that of other companies operating in the sharing economy, and all the drivers and contractants working in the industry? Courts of various instances were faced with other related legal issues. Among these is the question of whether Uber’s drivers are direct employees or independent contractors. If they are employees, the company needs to provide them with employee benefits, such as social security. The UK courts have already taken a stand, in that drivers are considered to be employees. In the USA, the question is still pending. Although the CJEU's ruling in December 2017 did not address the question of employment, it may also have a bearing on the issue. The lack of licences, safety considerations, and the non-fulfillment of other conditions that are generally necessary for taxi drivers (such as the type of car being used, insurance requirements, etc.) have also been raised in court cases. In the USA, which has the largest number of cases and class actions against Uber on record, the situation is even more complex due to procedural issues. Numerous disputes are awaiting a final decision on whether drivers can sue Uber in a court of law, or whether they need to resort to arbitration, since drivers’ contracts contain an arbitration clause to which drivers would have agreed before joining the company as service providers. Uber’s enormous exposure to litigation has triggered a chain of other cases. Among related issues are background checks for drivers, reports to regulatory authorities, the alleged drivers’ discrimination against blind people, and physical assault of customers. The lack of a clearly defined regulatory regime is perhaps the main reason for so many court cases. At the same time, legal loopholes are a motivation for some to exploit the situation through endless litigation for profit-making. That is why the international community should promptly react in creating a predictable legal framework for the sharing economy that will, at the same time, respect the interests of traditional professions as well as stimulate the digital economy and new business models. Uber has been involved in legal action over several issues, and in more than 25 countries. 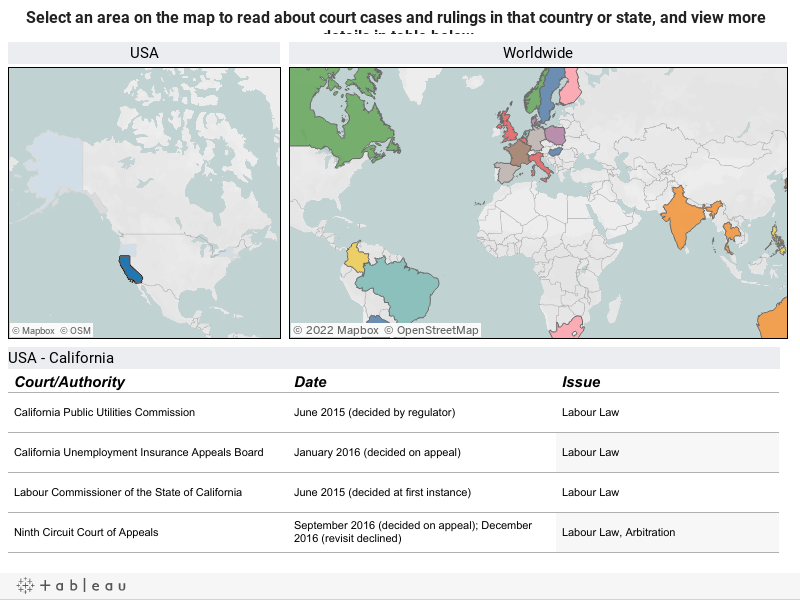 The interactive database below describes the court cases and other rulings, and include details such as the court or authority passing the ruling, dates, and status of the case. Hover over the right-hand column for descriptions. The issues tackled in the court cases and rulings by government authorities were categorised according to the taxonomy of 43 issues represented on the Digital Watch observatory, including: E-commerce, Convergence, Labour Law, and Arbitration. In our taxonomy, the shared economy is considered also from other Economis issues' perspective. Of the 53 cases surveyed in this study, convergence-related issues are predominant. These include both questions of licencing (taxi companies, largely, arguing that Uber does not have a licence to operate in the region), and classification (asking whether Uber should be classified as a technology company or a traditional taxi services). Issues related to labour law are also prominent. The main question is whether Uber drivers are employees or independent contractors. If they are employees - as some courts have already determined - the company would need to offer the same protection and social security benefits to its drivers as any regular employee. Competition was a widespread argument used by taxi companies in their cases against Uber involving questions of licencing; issues related to unfair practices include price-fixing, colluding, or misleading practices. Excluded from this study: cases dealing with criminal law (such as those related to indecent assault), and copyright casess they are not specific to ride-sharing). 4 July 2017: The Advocate General of the Court of Justice of the European Union (CJEU), Maciej Spunar, has issued another non binding opinion in which he classifies Uber as a transportation company. As summarised in a CJEU press release, the opinion, issued in a case brought to the CJEU by the tribunal de grande instance de Lille (France), states that EU member states may prohibit and punish the illegal exercise of a transport activity such as UberPop without having to notify the Commission of the draft law in advance. Spunar reiterates an argument he made in a previous opinion, in May 2017, stating that the UberPop service falls within the field of transport and does not constitute an information society service. 11 May 2017: The Advocate General of the Court of Justice of the European Union (CJEU), Maciej Szpunar, has issued a non binding opinion on the case in which the CJEU is asked whether Uber is an information society services provider or a transportation company. Szpunar is of the view that the service offered by Uber cannot be cannot be classified as an information society service, as the service amounts to the organisation and management of a comprehensive system for on-demand urban transport. He therefore recommends that the Court’s answer to the question at hand should be that the service offered by Uber must be classified as a service in the field of transport. Spuzar concludes that Uber is subject to the conditions under which non-resident carriers may operate transport services within EU member states. 28 March 2017: Uber has announced its intention to stop operating in Denmark from mid April, because of upcoming new proposed regulations that would introduce additional requirements on cars that function like taxis, such as mandatory fare meters and seat sensors. The company claims that it would have difficulties in complying with such requirements, and is still trying to convince the government to change the proposed regulations. 22 March 2017: In the framework of the country’s new national budget, Canadian government plans to amend its Excise Tax Act and redefine ride-sharing firms as taxi companies. This measure would affect providers of ride-sharing services, such as Uber, ending the tax advantages that they have over traditional taxi companies. The proposed amendments would force Uber to collect the goods and services tax of every ride provided (similar to taxi operators), which could result in higher fares for Uber customers in Canada. UPDATE: Uber Canada is asking the Canadian government to retain the tax advantage, and expand it to taxi services. 14 February 2017: A Brazilian labour court in Minas Gerais state ruled that a Uber driver is an employee of the company and is entitled to workers’ benefits. The judge also ordered Uber to pay one driver around $10,000 in compensation for overtime, night shifts, holidays, and expenses such as gasoline and water. The company reacted saying that it would appeal the decision, citing a contradictory ruling issued by another labour court in the same Brazilian state few weeks before. 2 February 2017: Uber has announced that it would suspend its services in Taiwan starting 10 February, following disputes with Taiwanese authorities. Uber has been operating in Taiwan as an Internet-based platform, and not a provider of transportation services, determining authorities to consider the business illegal, and to impose fines on the company. While Uber continues to argue that it is not a transportation company, its decision to suspend the services is likely to last until authorities ‘find a solution’, according to Reuters. 11 January 2017: Uber and the Roads and Transportation Authority (RTA) in the Emirate of Dubai have signed an agreement under which Uber becomes fully regulated by the RTA. According to the agreement, Uber will be able to use 14,000 vehicles through its app ‘as per the laws governing the operation of taxis and limousines in Dubai emirate’. The two parties will also work together on a project to study how the reduce road congestion and make transportation more affordable in the Emirate.